There’s a lot to be said about owning a truck. Like most important things in your life, you’ll get back what you put in. If you need your truck to deliver results every day, you should make sure that you take good care of your vehicle. Each make and model comes with specific needs, which means that you’ll need to check your owner’s manual for maintenance advice. However, these ten simple tips should help any truck continue running for a long time, so your truck loans will be worth it. Even though this is an easy thing to do, it’s surprising how many people neglect to do it. 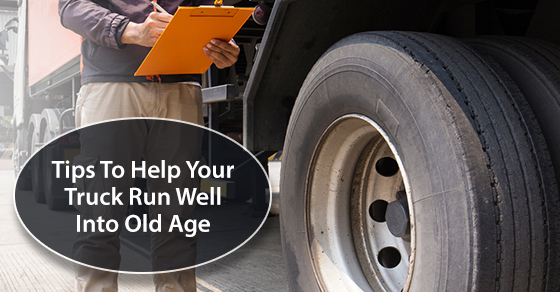 Oil changes are an incredibly important aspect of ensuring your truck’s longevity. If you have a truck newer than 2007, it’s recommended that your oil is changed either every six months or every 7,500 miles, depending on which comes first. When your truck is older and has a higher mileage, you should make sure that your oil filter is changed every time you change the oil. The oil you use should be the right oil for the vehicle. Some vehicles use synthetic oil, while others will take only natural oil. Your owner’s manual will tell you what type of oil is best for your engine. When you change the oil, you might as well take care of other basic maintenance issues as well. Rotating tires is first on the list. If you rotate your tires each time you do an oil change, you can make sure that the tires wear evenly. This is important because tires will wear unevenly based on the weight of your truck. Depending on how your truck is used, your front tires will probably become the most worn. When you rotate them with your back tires, you’ll extend tire life and make your rides smoother. This practice also reduces burdens on the suspension of your truck. Your owner’s manual will tell you what tire rotation pattern is most highly recommended. This is another maintenance issue that you can take care of when you rotate your tires. To balance a tire, you need to make sure that the tire’s weight has an equal distribution around the vehicle’s axle. Every time you go over a pothole, bump, or off the road entirely, your tires become increasingly unbalanced. Unbalanced tires have the potential to cause vibrations on the road and increase suspension wear. You can also get your tires balanced if you need to replace or patch a tire. When it’s time to do your oil change, if you’ve noticed that your truck veers to one side, you might need to align the wheels. If you often drive on rough roads at a high speed, or you drive aggressively, you’ll increase your chances of having misaligned tires. When your wheels are misaligned, your tires will be worn down more easily. You’re also likely to have worse gas mileage and difficulty handling the vehicle when you drive. At the beginning of each month, you should test all of your interior and exterior vehicle lights to make sure that they’re working. When there’s a dim light, you might have an electrical problem with your vehicle. Meanwhile, burned-out headlights can cause dangerous situations on the road — other drivers can’t see you in dim conditions. You might also be subject to hefty fines if you drive with a burned-out headlight. When you check your lights, you should also make sure that you have a number of spare fuses in your glove box. This can be done at the same time as your light check, at the beginning of each month. The most important fluid to check is your vehicle’s engine oil. You should only check the fluids after the engine has cooled down; otherwise, you’ll get an inaccurate reading. After you check the levels of the oil, you should check on the oil itself to make sure it’s not dirty. The next fluid to check is the engine coolant. You can pop the cap on the gauge to see what levels the coolant is at. Your owner’s manual will specify what type of coolant you need, so refill as directed. Like people, engines function best when given access to clean air. As time passes, air filters will become clogged with chemicals, debris, and dust. Every 15,000 to 30,000 miles should include a new air filter for your engine. If you’re often driving on unpaved roads, you should swap out the filter more often; do it every time you change the oil. Ultimately, you have control over the life of your truck. If you’re constantly putting your truck through extreme wear and tear, you’ll decrease its lifespan. Conversely, if you only drive on well-paved roads and take care to go the speed limit, you’re more likely to have a truck that lasts a long time. Whether your province requires a yearly inspection or not, it’s still a good idea to have one done. An expert can assess the health of your vehicle and determine whether any additional care or maintenance is required for your truck. It’s like bringing your truck to the doctor for a checkup. A technician can spot a potential problem before it turns into a costly repair issue. No, you don’t have to read the whole thing — but you should pay attention to the information about how to maintain your truck. Everything you need to know will be outlined in your owner’s manual, so keep it on hand.